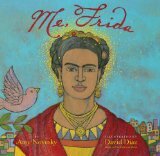 In celebration of Women’s History Month, we have Me, Frida by Amy Novesky and David Diaz, a picture book biography about Frida Kahlo’s time living in the city of San Francisco during the 1930s. Frida Kahlo’s trip to San Francisco with her husband, artist Diego Rivera, turned out to be a pivotal time in her life. At first she was out of her element because she had never been away from Mexico before and Diego was busy painting a series of murals. She used the time to stretch out of herself and practice her art, however, so that she grew and developed her own unique painting style. The illustrations by Caldecott-winning artist David Diaz positively glow. The dramatic look was created using charcoal, acrylic paint and varnish on a linen background. The linen gives the illustrations a wonderful texture. Me, Frida is a lively snip-it from Frida Kahlo’s life that is sure to inspire children to want to find out more about the artist. As well as useful for Women’s History Month, it could also be a jumping off point for many exciting art projects. Do you remember the earlier book Latino/Latina challenge book, What Can You Do With a Rebozo? This would be a wonderful book to accompany it, as many of the illustrations show Frida wearing a rebozo. For an art activity, kids enjoy creating their own artwork with fabric paint on cloth (see The Artful Parent, for example). Also, see Frida Kahlo and Diego Rivera: Their Lives and Ideas, 24 Activities by Carol Sabbeth for more ideas. Look for 2014 Latin@s in Kid Lit Reading Challenge books on the third Wednesday of each month. Interested in multicultural children’s books? Follow the our pinterest board.